Arduino is an open source hardware and software project, aiming to provide an accessible way for novices and professionals to create devices that interact with their environment using sensors and actuators. Arduino comes in a variety of different boards, that are available commercially in pre-assembled form, or as do-it-yourself kits. The hardware design specifications are openly available and consists of an Atmel 8-, 16- or 32-bit AVR microcontroller. Official Arduinos had used the Atmel megaAVR series of chips, specifically the ATmega8, ATmega168, ATmega328, ATmega1280, and ATmega2560. The project is based on microcontroller board designs, implemented on several different boards, each with different capabilities. 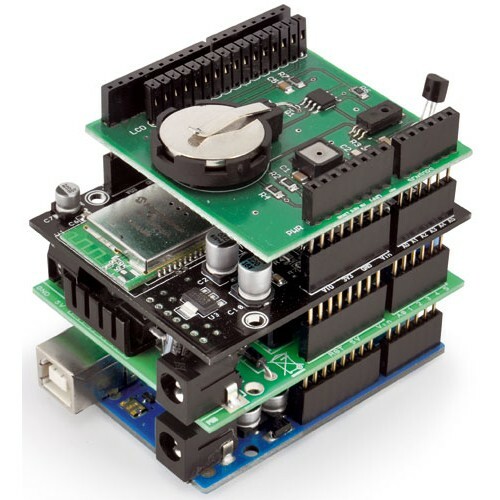 In addition, part of being open source hardware means that others can modify and produce derivatives of Arduino boards that provide even more form factors and functionality. With the Arduino Due a revolution took on the Arduino platform, with an entirely different processor architecture – ARM instead of AVR. It’s a 32-bit processor, clocks in at 84 MHz, and has native USB support. The Arduino board exposes most of the microcontroller’s I/O pins for use by other circuits. These signals can be used by expansion boards called shields, which plug into the normally supplied Arduino pin headers. 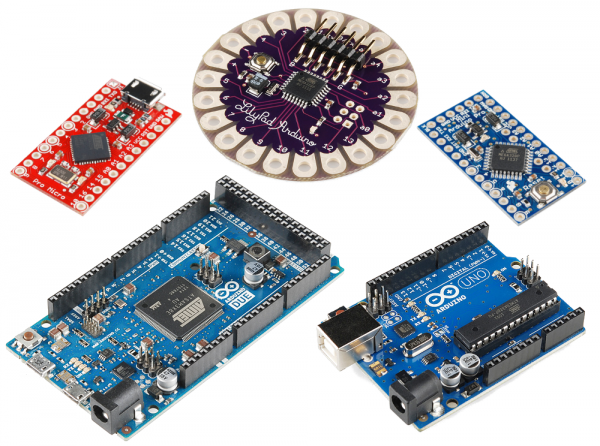 Many Arduino shields are stackable. A comprehensive list of both official and unofficial Arduino shields is maintained at shieldlist.org. Shields are often supplied with either an example sketch, or a library. The Arduino project provides the Arduino integrated development environment (IDE). It includes a code editor with features such as syntax highlighting, brace matching, cutting/pasting text, searching/replacing text and automatic indentation, and provides simple one-click mechanism to compile and upload programs to an Arduino board. With some simple code, the Arduino can control and interact with a wide variety of sensors that can measure light, temperature, displacement, pressure, proximity, acceleration, gases, radioactivity, humidity, barometric pressure and many other physical parameters.